The North American Indian being a series of volumes picturing and describing the Indians of the United States. 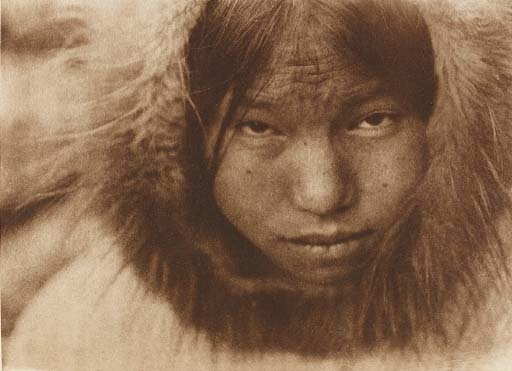 the dominion of Canada, and Alaska written, illustrated, and published by Edward S.Curtis. Norwood, Massachusetts: Plimpton Press, 1930. 4° (310 x 240mm). Title printed in red and black. 75 photogravure plates (2 hand-coloured), all on india paper mounted, after Edward Curtis, 2 maps and plans, one full-page illustration. Contemporary brown/green half-morocco gilt, t.e.g. (light scuffing). Provenance: Lee D. Witkin (1935-1984, estate stamps). Limited edition of 500 copies, this numbered 239. The final volume from Curtis' monumental work, here in its rarest form - with the plates on india paper, mounted. This volume records in detail various Alaskan Innuit peoples: the Nunivak; the Noatak; the Kobuk; the Selawik and Innuit populations at Hooper Bay, King Island, Little Diomede Island, Cape Prince of Wales and the 'Kotzbue Eskimo'. Cf.Howes C-965; cf.Truthful Lens 40.